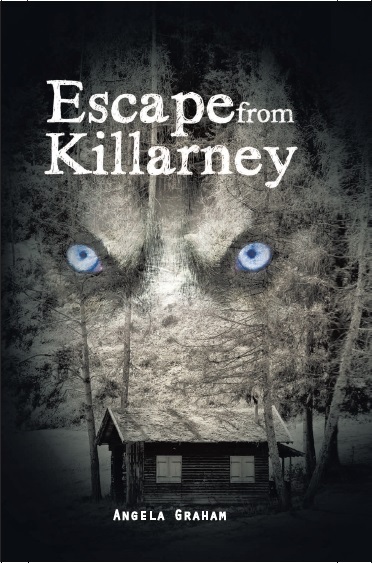 ‘Escape from Killarney’ tells story of dog and children’s struggle to survive Canadian backcountry. Author Angela Graham remembers the horror of last summer’s encounter with a potentially predatory mother black bear and cubs. “It was sundown and we were deep in the interior,” recalls Graham. “We had no option but to abandon our campsite and hike out.” In a race against the falling darkness, her family’s struggle to get safely out of the backcountry inspired Graham’s new middle grade adventure novel, “Escape from Killarney” http://www.angelagraham.webs.com . The beast is closing the distance between itself and the kids, and I can see that it is huffing and snorting angry warnings to them. I suddenly see why. Behind her—I can see now that it is a “her”—are two smaller black forms. They huddle close together, watching their mother stand her ground to protect their blueberry patch. Their mother stops. She stares at the kids and bangs her massive paw on the ground. I feel the earth shake through the water, and I race forward. Graham pulls himself to his feet, takes Evelyn by the arm, and encourages her to stand as well. He raises his arms high above his head, and Evelyn copies his action. The bear—as that is what this massive form is—does the same, and raises herself on her back haunches. She towers above the children, her front legs pawing the air. I hear her growl above my splashing, as my feet find the shore rock and I claw my way out of the lake. I scream ferocious threats at her as I charge in. Her eyes snap in my direction, and her glare gores through me. As her paws drop to the ground in my direction, I once again feel the ground shift under her weight. “Hmphf!” she snorts at me. Born and raised in Ontario, Canada, Angela Graham spent her youth in the heart of nearby forests. As an adult and outdoor enthusiast, she spends her downtime escaping into the Canadian wilderness, seeking tranquility and adventure. She currently lives in Ottawa, Canada with her husband, two lively children, and their dog. To learn more about her, visit her website at http://www.angelgraham.webs.com.